Chicago is known for many things including great food like Italian Beef, Deep Dish Pizza and Hot dogs. 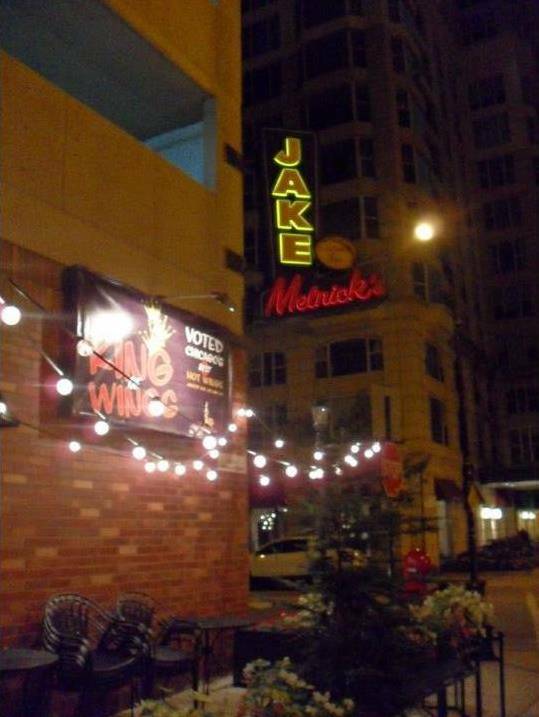 So, when we came across Jake Melnick’s Corner Tap, we were a little hesistant because it claims to have award winning wings. However, we were super hungry and didn’t want to walk anywhere else. This restuarant is setup like your typical bar/resturant. There was a bar in the center, with high tops and four-top tables surrounding it. It is very remnisicent of TGI Fridays or Chilis. Within minutes of being sat, we were greeted by our server. He was nice and cordial. We had several questions, and he was able to answer each one throughly. The only compaint about our service is that I think he was tired, which caused him to be a little forgetful. We’d order something and he’d forget we mentioned it. Even with his forgetfulness, I thought the service was good. The menu definitely had its share of appetizing entrees, but as I mentioned before, this place was awarded for its great wings. It was a necessity that we try the wings. We didn’t want the wings as an entree. So, we ordered the combo wings, which included 4 traditional wings and 4 Poncho wings. While I did like the traditional wingsl, I definitely liked the Poncho wings better. They were grilled and marinaded in Garlic and Cayenne Pepper. I thought it was going to be spicy, but it wasn’t at all, which is probably why I really liked them and would recommend them. 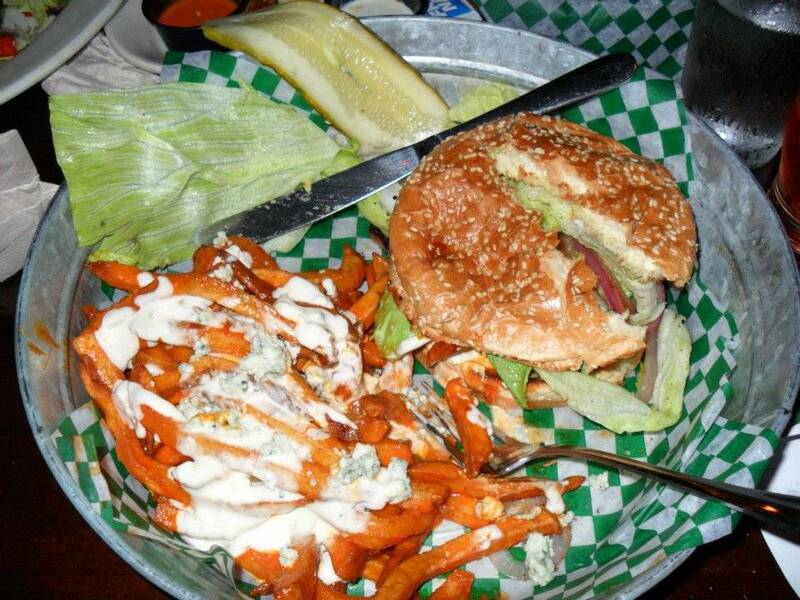 For my entree, I ordered buffulo fries drizzled in bleu cheese and a turkey burger with Swiss cheese, onions, mushrooms and avocado. Yes, I took it all the way, and have no regrets. This was so good, and was definitely one of the best turkey burgers I’ve ever had. It was huge and I could only finish a half. It was grilled just right! It wasn’t too soft or too hard, it was perfecto! I had a really good dining experience here. The food is affordably priced, the service is good, and the food was amazing. I’d definitely recommend this spot to visitors to the Chicago area and to the native Chicagoans. Posted on Thu.Sep.13.2012, in Bon Appetit and tagged atmosphere, bar and restaurant, bar/restaurant, bars, best wings, complaint, deep dish pizza, Dining out, dinner, eating, eating healthy, eating out, entertainment, food, good atmosphere, good service, Jack Melnick's Corner Tap, Jack Melnicks, place to eat, places to eat, positive, recommend, Restaurant, restaurants, resturants, review, service, tgi fridays, travel, turkey burger, turkey burgers, vacation, wings. Bookmark the permalink. Leave a comment.